An active substance that destroys adult Thrips. An active substance that eliminates Thrips eggs and larvae. A Plant nutrition and foliage protector to help aid recovery from infestation. Each 25ml bottle contains enough Thrips Terminator to make 3L, simply shake well and mix with warm water. Spray during dark period, 2L Pump Sprayer and Accessories sold separately. 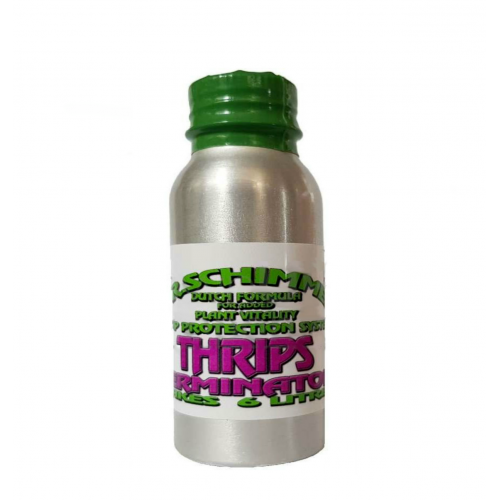 Dr Schimmel Thrips TerminatorDr Schimmel Thrips Terminator offers complete plant protection against ..
Guard n Aid Pest OffA broad spectrum Pyrethrum-based contact insecticide for the control of many suc..